A man was early Friday morning shot after he chopped a policeman who responded to a report that he was beating his mother at their home at Herstelling, East Bank Demerara. Police said at about 2:30 Friday morning, a 33-year old man was shot twice and the policeman chopped twice.The incident occurred when a police patrol responded to a report of a son beating his 60 year-old mother. Sources said the woman has been identified as Daphne George, her son Christopher Trim and the policeman is Constable Mingo. 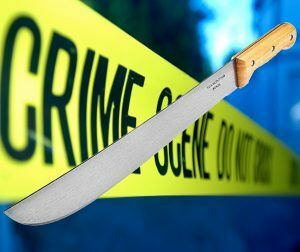 “The son when confronted,armed himself with a cutlass and menacingly attacked and dealt the rank two chops on his left hand and left knee ; the injured constable instinctively drew his service revolver and discharged two rounds which struck his attacker in the right arm and right collarbone,” the Guyana Police Force said in a statement.